A great Indian poet and a Nobel Laureate once said that a community of God-seekers is a great thing, but the moment it begins to organise Truth, it may admit the Devil through the back door! This is a critical view of spiritual organisations. Let us examine how far and to what extent this perspective is true or valid. In this article, we use the term “spiritual organisation” to denote organisations with a spiritual aim, aspiring and striving to realise it in their collective life and aiming at the inner growth of their members. There is nothing inherently unspiritual or evil in organisation. An integral spirituality which embraces life must know how to use organisation to enhance its effectiveness in communicating or realising its spiritual ideals in the outer life. But when a spiritual organisation subordinates the inner spiritual growth of its members to the mundane aims of the organisation like efficiency, then what the poet says may happen. This doesn’t mean rejection of these worldly goals. Here again, an integral spirituality will try to integrate the spiritual and secular goals in a holistic hierarchy of values. But when the spiritual goals are subordinated to mundane goals, it is no longer a spiritual organisation. This is an alluring and deceptive danger for a spiritual organisation. When the aims of the of the organisations slips from the spiritual to the mundane goals, and the members of the organisation have the capacities to realise these aims, then the organisation may flourish externally, becoming more efficient, productive, expansive with a prolific work output; it may become an object of admiration for the world because most of us can see only the outer appearance and not the inner condition of things. Leaders of the organisation may proudly proclaim to the world that they are proving what spirituality can do to the richness of the outer life when there is nothing spiritual in the achievement. In this process the organisation may entirely loose its receptivity to the spiritual force, which means inner death as a result of outer success. It is something like what Sri Aurobindo says in the Life Divine on what happens to ideas and ideals in life, “the truth of the idea is deceived by the actual outcome of its pragmatic success”. This applies not only to a spiritual organisation but also to a nation like India with a spiritual destiny and mission for bringing the light of spirituality to the world. Sri Aurobindo made the following significant remarks in his message to the Andhra University. “There are deeper issues for India herself, since by following certain tempting directions she may conceivably become a nation like many others, evolving an opulent industry and commerce, a powerful organisation of social and political life, an immense military strength, practicing power-politics with a high degree of success, guarding and extending zealously her gains and her interests, dominating even a large part of the world, but in this apparently magnificent progression forfeiting its Swadharma, losing its soul. Then ancient India and her spirit might disappear altogether and we would have only one more nation like the others and that would be a real gain neither to the world nor to us. There is a question whether she may prosper more harmlessly in the outward life yet lose altogether her richly massed and firmly held spiritual experience and knowledge. It would be a tragic irony of fate if India were to throw away her spiritual heritage at the very moment when in the rest of the world there is more and more a turning towards her for spiritual help and a saving Light”. This brings us to the question how to prevent this danger and what is the right approach for a spiritual organisation or a nation like India? Let us first examine this question at the organisational level. At present corporate strategies, methods and techniques of organisation are very popular. Many management thinkers believe that these methods are universal and can be applied to all organisations. But this is not entirely true. Most of these corporate methods are evolved in business organisations with a predominant emphasis on maximising efficiency, productivity or profit. They have certain universality in managing material resources or organisational machineries like projects, systems, processes, but may not be valid for managing people in all types of organisation. In this people domain each organisation has to evolve a unique approach which is in harmony with the nature, goals and values of the organisation. In the future world, non-business organisations with social, moral and spiritual aims are likely to grow in importance and numbers. For as Sri Aurobindo points out “… in the next stage of human progress it is not a material but a spiritual, moral and psychical advance that is to be made. “As this future evolution unfolds and more and more people seek for a moral, psychological and spiritual fulfilment in their work and life, the importance of cultural and spiritual organisations which can help people in this inner awakening and fulfilment will be increasingly felt in the collective life. Let us now examine what has to be the right approach in managing such organisation with the example and experiences of an organisation based on a philosophy of integral spirituality, which aims not only at the liberation of the soul but also at the transformation of human nature and spiritualisation of the outer life. In such an organisation, neither the strict ascetic discipline of a world denying spirituality nor the corporate methods of efficiency or productivity can be the right approach. Bare simplicity of meditating monks is not the ideal of integral spirituality. On the other hand, organised efficiency or a planned systematic effort towards predetermined quantitative targets cannot also be the right approach for a spiritual organisation. 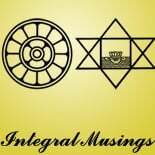 For the flowering of integral spirituality, central thrust has to be to create an environment where each member of the organisation is given the freedom and opportunities not only to grow inwardly but also to express his or her inner growth in the outer life through whatever capacities or skills he or she has. Members are chosen not on the basis of capacities or skills but on their inner sincerity, aspiration or affinity to the integral spiritual ideals. In the outer life, projects, initiatives and activities are chosen based on the skills, capacities and interest of people or their representative character. For an organisation based on integral spirituality which embraces life, all the major activities of contemporary life has to be represented. Apart from the more or less permanent members of the organisation, it may also reach out to people outside with its message or ideal of integral spirituality with whatever technological tools available and provide opportunities for people with a higher aspiration to stay, study or work in the organisation for a period and get the touch of the integral ideal. Ideally, in such an organisation, individuals and teams have to be judged not by their efficiency or productivity but by their inner progress and their contribution to the inner growth of the organisation. For example, in the corporate world, a team is judged entirely by its productivity. But in a spiritual organisation based on inner growth of people, if a team is growing inwardly in consciousness in terms of harmony, good will, love and unity, its outer productivity is of secondary importance, because it is contributing to the inner growth of the organisation. The external productivity of a team depends mainly on the capacity, skill and faculties of the team members and not on their spiritual development. Someone maybe inwardly very advanced, kind, compassionate, understanding, with a deep spiritual insight or vision, but if there is some defect or weakness in his dynamic faculties of action he may not be very productive in his work. If he works in some corporates, one day he will be fired for his low performance. Conversely, another one may be inwardly primitive and underdeveloped, full of negative thoughts and feelings in his mind and heart but if he has great capacity and energy in his faculties of action, he will be tremendously efficient and productive in his work. If he is part of the corporate world he will be admired as a star- performer and one day may become a CEO! Productivity is a corporate ideal which may be good, right, dharmic or even very important for a business organisation but cannot be the core value of a spiritual organisation, especially in judging or assessing people. Inner harmony is an aesthetic and spiritual ideal which will make the organisation inwardly receptive to the divine forces of Mahalakshmi. A kindly and harmonious relationship with people, with a humble attitude of helpfulness, is perhaps more conducive to inner progress than doing big things or a prodigious work out-put and feeling very proud of it, which develops only the ego and not the soul. But if the members of a team are constantly quarrelling and criticising and in inner and outer conflict with each other, they are not contributing to the inner growth of the organisation, however great may be its outer productivity. The integral vision may include the corporate as well as the spiritual ideal, but if the spiritual is the foundation, then the primary focus has to be on this inner dimension. But this ideal based on inner growth can be lived with an entire effectiveness only when the leaders of the organisation have the inner spiritual vision to see the inner condition of the people and their true inner and outer contribution. When the leaders don’t have this spiritual consciousness, the next best alternative is self-assessment and leave each one to his own inner conscience and spiritual responsibility to his or her highest self or the Divine within him or her. The rest of the management process can only be described as “experimental evolution”. The management tells people “you are here because the Divine within you brought you here for your higher evolution. It is up to you to make the freedom and opportunities given here for your inner awakening. It is a matter between you and the Divine within you”. A spiritual organisation which aims at free inner growth of people will not impose discipline from above on its members. The relationship between the leaders and members and between members will be based on goodwill, trust and understanding, founded on the perception or feeling that all are children of God and cotravellers in the path to the Divine and with a generous faith everyone is doing his or her best. As Mother describes these attitudes in one of her conversations: “you understand the faults of others, their intentions, and weakness, even nasty moments, you see all this, and you are full of good feelings of generosity; you tell yourself, well, everyone does his best”. In the outer life, there may be an outer functional hierarchy but with an inner sense of equality and fraternity. I think what Mother says here applies equally to indiscipline among the members of a spiritual organisation. Each member is given the freedom to organise his work and life according to his inner needs with a self-imposed discipline. If he misuses the freedom or indulges in laziness or indiscipline, he suffers inwardly. Change and progress have to come from within either by a glad, voluntary self-imposed discipline or by suffering the consequences of one’s action. You don’t wish or want the erring member to suffer. But when you don’t follow the laws which are intrinsic to a path, it has its consequence which comes not as punishment but as part of the learning process. But an externally imposed discipline on an unwilling member cannot lead to any lasting inner change. I may follow the discipline reluctantly, out of compulsion, with anger and resentment and without joy, which makes my inner condition still worse. When someone was forced to do what he didn’t like to do, Mother said: it was wrong to make one do what one does not do with one’s heart in it. (‘Mother and I’ by M.P.Pandit Pg.30) Interestingly, this principle is now recognised even by some corporate leaders. Nilofav Merchant, former President of Rubicon Consultant, USA, says “I never wanted to spend my energy trying to get a person to do something that they did not want to do. I always wanted to find a way to bring out the person’s essence”. The only exception to this principle is when the discipline is imposed by a true Master living in the spiritual consciousness, with an inner vision which sees that in the present condition of the individual or the group, this is the only way to make him or the group to progress. With this attitude or approach you try with various initiatives, projects, activities and different kinds of people. Some of them may succeed, others fail; some may make use of the opportunities and progress, others may not; some arrangement may go well, others may not work. But these are part of the risk and difficulties involved in experimental evolution. reason why I can’t subscribe to it. Is there anybody else getting similar RSS issues? This entry was posted on August 31, 2015 by integralmusings in Religion, Spirituality & Philosophy.